Dandelion brews up into a smooth tasting, mellow, mildly coffee-like drink. Cautions: Drinking dandelion at night may cause some midnight night trips to the bathroom. 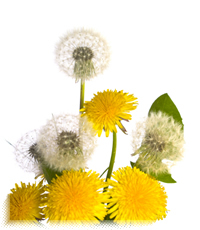 Wildharvest only those dandelion plants you can be sure have not been sprayed with pesticides. Recipe Instructions: Decoction :Use 1 to 3 teaspoons of chopped dandelion root per cut of water, adjusting for taste. Bring to a boil, turn down heat and simmer in covered saucepan for 10 to 20 minutes. Drink 1 to 2 cups daily as a general tonic.